(Science News) – About a quarter of the Melanesian population in the Solomon Islands archipelago has an extremely unusual trait – dark skin with blond hair. The archipelago, located east of Papa New Guinea in Oceania, consists of a thousand islands inhabited by over half a million Melanesian people. They have the darkest skin in the world outside of Africa, but strangely, about one-fourth of the inhabitants sport blond afros. This rare Melanesian characteristic has baffled scientists and genetic experts for years. Up until now, they have attributed the trait to inheritance – from the Europeans, especially the British, German and Australians, who have been associated with the island for hundreds of years. Several of the islands were under German jurisdiction in the 19th century. In 1893, the UK took southern Solomon Islands under their wing, declaring the region a protectorate. The rest of the islands were added to the protectorate at a later stage. And in the early 20th century, Australian and British companies set up coconut plantations on many of the islands. So it isn’t entirely unbelievable that the dark-skinned Melanesians got their blond hair from the growing influx of ‘outsiders’. The locals, however, prefer not to go by that theory. They have been insisting for years that their blond hair is a result of a diet rich in fish and constant exposure to the sun. As it turns out, both theories are quite far from the truth. 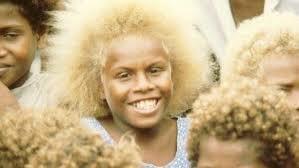 According to a recent investigation, random mutation might actually be the answer to the mystery of the Melanesian blonds.